Will Debt Management Help You? Like so many others across the country, many California residents are struggling with high interest credit cards and other unsecured debts such as medical bills, store cards, gas cards, and more. Many are searching for information regarding debt management programs, or debt management plans (DMPs) coordinated by credit counselors or debt counselors. If you're in this situation, you may also be considering alternative debt relief options such as debt settlement, debt negotiation, or even bankruptcy. It's important to understand the distinction between these debt relief options and the role they play to help provide relief for consumers experiencing financial hardship. A debt management or credit counseling program provides consumers the opportunity to combine or consolidate high interest credit cards and other unsecured debts into a single, more manageable payment each month. By taking advantage of the benefits of debt relief such as lower interest rates and the waiving of late fees and penalties, a debt management plan coordinated by a credit counselor or debt counselor is designed to help consumers save a substantial amount of money and get out of debt at an accelerated pace. The debt management plan will include the creditors who agree to the proposals submitted by the credit or debt counselors. For creditors who do not agree to extend the benefits of debt relief, consumers are still obligated according to the original terms of their cardholder agreements. Through certified credit counselors or debt counselors, credit counseling agencies can also provide a variety of additional debt relief services including help with budgeting, developing good spending habits, financial education and more. Truly exceptional credit counseling agencies will always include a strong educational component to their program. 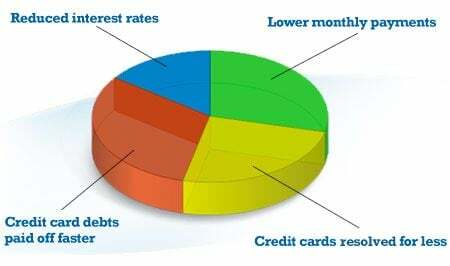 They will not only help the individual or family get out of debt, they will also help the consumer understand the root cause of the debt crisis and give them tools and knowledge to put the cycle of debt to an end. Although credit counseling is a proven method for debt relief that has helped many individuals and families, it's important to know that debt management requires basic discipline and restraint to avoid using credit cards, to making on-time consolidated payments month after month, and an overall commitment to stay the course that typically takes three to five years before debts are completely resolved and the debt-free day arrives! That may seem like an extended period of time, but faced with the prospect of a lifetime of debt, just a few years of discipline to get on track financially can save years and years of stress and heartache. Although the state of California does not provide debt grants or programs to help consumers resolve their debts, it does provide a variety of programs for individuals and families who are low-income or need a helping hand while experiencing difficult circumstances. These programs are specifically designed to provide more immediate financial assistance and relief, and helps individuals and families with children get access to food, healthcare, and other basic necessities. California also has agencies that can assist with housing concerns and help consumers avoid foreclosure. To learn more about these services, go to the state's homepage and click on the Benefits page. These days, many consumers may also consider alternative debt relief options to credit counseling such as debt settlement or debt negotiation. Individuals and families who have high interest, high-balance credit card debt and seriously considering bankruptcy may find that a debt settlement program to be an effective and proven way out of debt. It's worth noting, however, that settling debts is a more aggressive form of debt relief that has helped consumers get out of credit card debt faster, assuming the consumer can accumulate money in a "set aside" account which can later be used to extend a settlement offer to creditors. It's important to understand the difference between debt settlement and debt management: With debt management you are essentially paying off everything you owe, but saving money through much lower interest rates and a waiving of late fees and penalties. The goal of debt settlement is to "settle" with credit card companies for substantially less than you currently owe. Why would credit card companies consider "settling" with consumers? If credit card companies decide eventually to "sell off" accounts that are 60 to 90 days late, or more, to a collection agency, creditors may get as little as 10 cents on the dollar, so it is not surprising that credit card companies may be willing to accept a reasonable settlement offer made by you or by a debt settlement company negotiating on your behalf. It is important to recognize that when consumers default on their credit card agreements in order to set aside money in a settlement fund, creditors may threaten or take legal action. In addition, money saved through credit card settlements are subject to federal taxation. Finally, debt settlement typically will have a negative impact on personal credit, but not as serious or long lasting of an impact as personal bankruptcy. Take a moment to answer a few basic questions so we can connect you to a BBB-accredited debt relief provider who may assist you in comparing your debt relief options. Prior to enrolling in any debt relief program, it is important to understand clearly how much debt relief can potentially save, how long it will take to realize those savings, and the impact that any debt relief program could have on personal credit and taxes. To learn what debt relief could do for you and get an estimate of how much you could potentially save - take a moment to answer a few questions online. 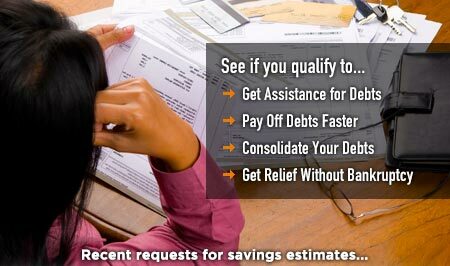 Get your free debt relief analysis and savings estimate today.